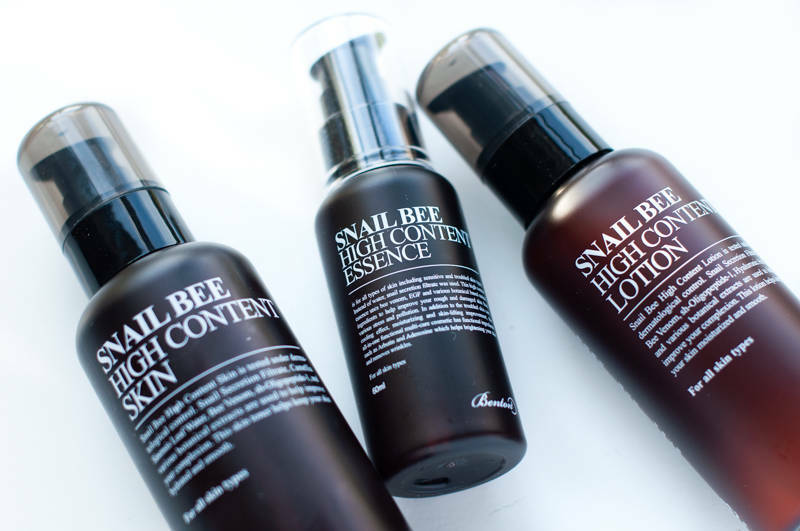 On my wish list for the longest time and finally ready to review: the Benton Snail Bee High Content line. If the thought of snail secretion sounds disgusting, I’m here to break it to you: this ingredient changed my life for the better and I couldn’t imagine my skin care routine without it! The Snail Bee lines comes in a handful of products and I’ll be reviewing 3 of them today. 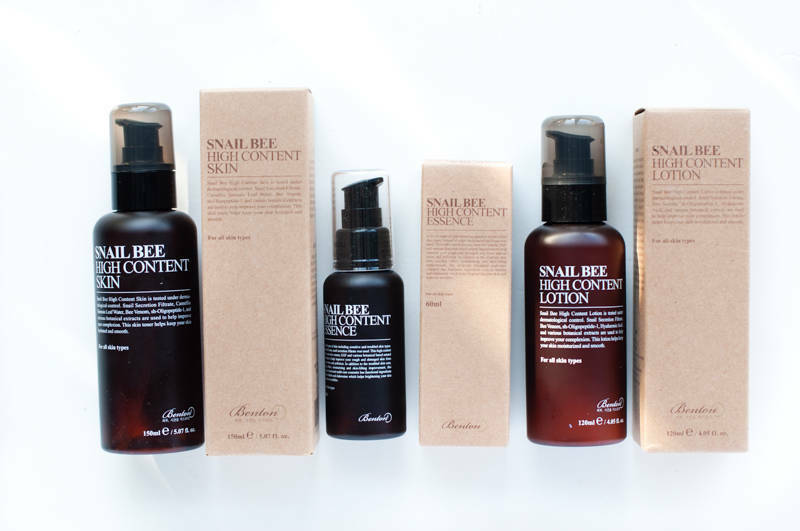 The Benton Snail Bee High Content Skin is a Korean toner used after cleansing. While Western toners are used for additional cleansing or astringents, Asian toners are typically more hydrating and meant to prep the skin so that the following products are better absorbed. This product has a lightweight watery consistency and is perfect for sensitive skin. Benton is known for its skin care that is jam packed with beneficial skincare ingredients without the fillers and the High Content Skin (toner) is no different. Snail secretion filtrate is the star of the show. With its antimicrobial wound healing abilities, this ingredients is particularly helpful to battle acne and reduce acne scarring. 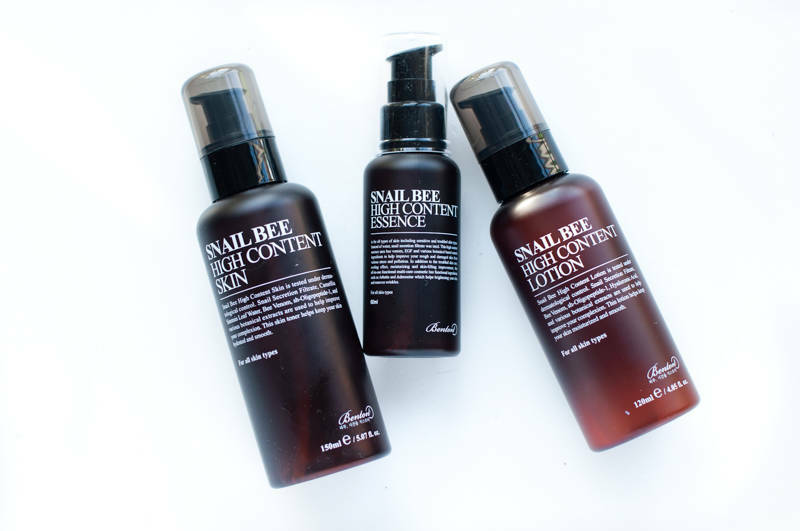 After the Skin, it’s time for the Benton Snail Bee High Content Essence step. This gel serum is just as packed with active ingredients as its predecessor and is marketed as being anti-acne, brightening, ant-wrinkle and moisturizing. I haven’t had any negative experiences with this product although I have read there have been some issues with mold in the past. The Benton Snail Bee High Content Lotion is my least favourite of the 3 products I’ve tried and also the only one I wouldn’t buy again. It didn’t blend into my skin as fast and flawlessly as I would expect from a lotion. Quite on the contrary, it would often leave a white cast on my skin, so I ended up only putting it on in the evening. Overall, I’m impressed with the ingredients list that was used in these affordable products. You can definitely use them separately, although they can truly work their magic against acne when used together. Just keep in mind to store them in a cool and dry place as they only contain natural preservatives. As mentioned above, I would repurchase the Skin and Essence and try some of the other products from the line; sheet mask, ampoule and steam cream. Benton is available at various K-beauty retailers, iHerb, Lookfantastic, Beautybay, Bol, etc.